This really was a space odyssey for one presidential candidate bobblehead. 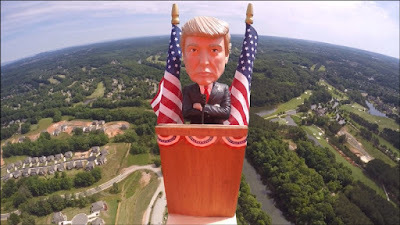 A bobblehead of Donald Trump, standing on a podium flanked by American flags, was attached to a high altitude weather balloon. The bobblehead was trimmed for weight and carried three GPS trackers and a camera to record the momentous event. The launch occurred in Suwanee, Georgia. This really was a space odyssey for one presidential candidate bobblehead. 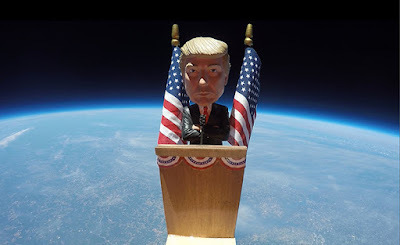 A bobblehead of Donald Trump, standing on a podium flanked by American flags, was attached to a high altitude weather balloon. The bobblehead was trimmed for weight and carried three GPS trackers and a camera to record the momentous event. The launch occurred in Suwanee, Georgia. Why send the bobblehead into space? Warren Royal, founder of Bobbleheads.com, got the idea from a 2012 "Obama in Space" video on YouTube. "The Obama bobblehead was one of our Royal Bobbles products and I thought that was really cool," Royal said. "Since then, we have been trying to find the right product and the right time to do it, and with the upcoming election, we felt that this was a great time." 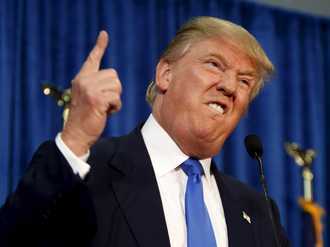 "We decided to go with Mr. Trump first because he is far and away our best-selling bobblehead at the moment. We figured that we would do him first and then if we had the time, we would try to do Hillary and other popular figures later." Royal also wanted to make it perfectly clear that this was non-partisan, simply meant to be a fun event. "We're not taking sides," he added – "We have something for everyone." The helium-filled balloon, with the Trump bobble and the "payload," lifted off on Sunday, May 15. It climbed to an altitude of 103,339 feet, which took about two hours; then the balloon burst, which it is designed to do at that height. "This was more time-consuming and complicated than we thought," said Royal. "We are glad we did it, though, it was amazing!" The entire launch assembly – bobblehead, podium, flags and microphone – will be displayed in a shadowbox at the company's Georgia headquarters. The video of the launch can be watched below. A second "behind the scenes" video of the retrieval is in production now and will be published soon.